I have a lot on my mind, so bear with me over these next couple posts as I try to bring some order to my thoughts. First, I want to talk more about the Buddy Walk. We had 33 people walk with Team Lina. I don’t have the words to express how much every one of you means to us. The support is incredible, not just for this moment, but because of what it means for the future, for Lina, for our family, for the thousands of other people in our community who have Down syndrome or love someone who does and for many more who will come after us. I’ve thought quite a bit the last few days about the question, “Why do we have the Buddy Walk?” The first and most obvious answer is that it serves as a rallying event for fundraising. This one event is the primary fundraiser for an entire year of programs and services. Trust me when I say, those services are really important. From the moment parents receive a Down syndrome diagnosis for an unborn or newborn baby, they have access to balanced, accurate information and first-hand experiences, delivered by a loving community of people eager to embrace them and their new child. That child and his or her family then continue to have access to seminars, social activities, educational and advocacy resources, concrete help like hot meals delivered to hospital rooms during illness or surgery… Our local organization is also often asked to provide a speaker and educational materials to school groups, community organizations, classes of special education teachers in training, medical professionals… This is the voice of real experience for those who teach, interact with and treat people with Down syndrome. Our organization joins others to advocate at the local, state and national level for public policies important to people with Down syndrome. All of this requires organization, planning and funds. This year, the Down Syndrome Association of Middle Tennessee raised just over $200,000 in Buddy Walk fundraising. Those funds make a concrete difference in our family’s experience now and in how Lina will be viewed and the opportunities available to her in the future. But there is more to the Buddy Walk. The family and friends who joined us this year will tell you it’s a huge celebration, so full of joy and camaraderie. This is an open event where we take time every year to shout to our community and the world, “Down syndrome is not sad. It is not something to be apologized for or hidden away. We celebrate loved ones with Down syndrome because of what they bring to our lives and to this community.” It is an opportunity to counter stereotypes, to model open-armed love and acceptance, to mark progress, to share in a powerful community of people who know what this love feels like. It’s joyful, because loving a person with Down syndrome is joyful. Yes, it can be hard. Love is always hard, because it leaves us vulnerable and requires tremendous sacrifice. But every person in that crowd of thousands knows it’s worth it, because real, bone-deep, unselfish love always is. I dissolved into tears just once during the Buddy Walk. 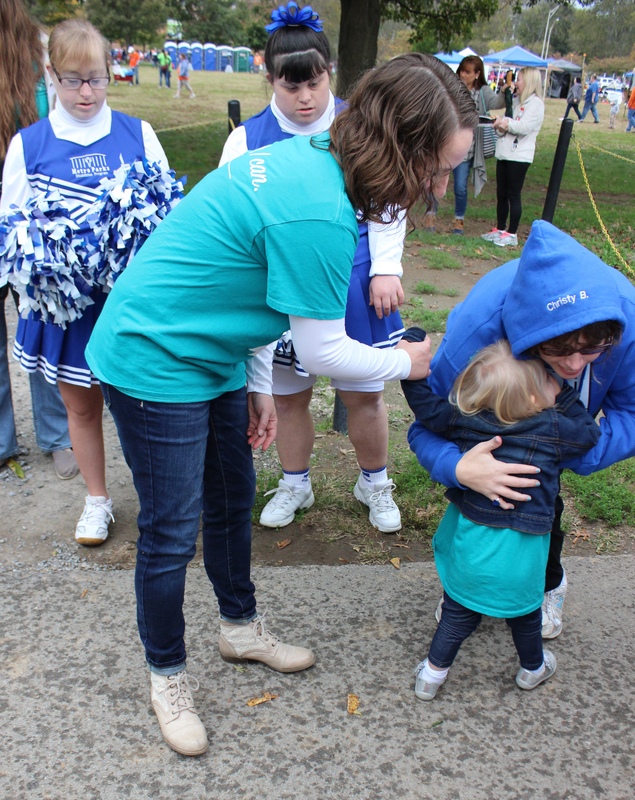 It was at the end of the walk, as Lina stopped to give high fives and hugs to a troupe of cheerleaders with special needs. They adored her, and she gave unquestioning affection in return. My tears could have been mistaken for ones of fear and pain, and if I’m honest, perhaps there was some of that in there somewhere; but mostly, I cried then and still cry when I remember it because of how perfectly beautiful it was. I know the world can be a very cruel place, but here, there is simple joy in a hug. I thank God for these moments, because my soul will never be the same. This entry was posted in Down syndrome awareness and tagged buddy walk, buddy walk 2015, down syndrome association of middle tennessee.